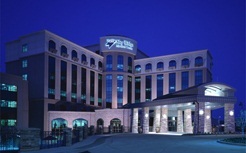 Sky Ridge Medical Center, a Level II Trauma Center, is a full-service, 284-bed destination hospital with a reputation for clinical excellence and world-class service. Sky Ridge offers compassionate care through patient-centered programs such as a comprehensive Cancer Center, adult and pediatric ERs, an award-winning Birth Place and a state of the art Spine and Total Joint Center. Sky Ridge is located on a 57-acre campus at the southwest corner of I-25 and Lincoln Avenue in Lone Tree, Douglas County, Colorado (south Denver Metro area). Lone Tree is a southeastern suburb of Denver, Colorado - a major metro area of 2.8 million nestled at the foot of the Rocky Mountain Range. Denver is one of the nation's fastest-growing cities with a highly educated population. Metro Denver offers a panoramic view of the Rocky Mountains, the nation’s largest public park system, and 300 days of sunshine a year. As a result of these and other amenities, the metro area consistently tops the lists of most livable cities. Douglas County is recognized for being one of the most family friendly communities in Colorado, offering a quality of life unmatched elsewhere in the state. For the fourth year in a row, Douglas County ranks in the top ten happiest counties in the United States. The area’s unemployment rate is the lowest in Metro Denver at 2.5 percent and also ranks No. 1 in Colorado for overall health behavior for eighth consecutive year.